September 12 is the best day to drink chocolate milkshakes as it is the National Chocolate Milkshake Day! The milkshake has been around since the late 19th century. It was originally an alcoholic beverage made with whiskey. A modern milkshake, however, is a non-alcoholic sweet beverage usually made with milk, ice cream, and sweeteners or flavorings. It is typically served cold. The most popular flavorings added to milkshakes are: fruit syrup, caramel sauce, butterscotch, and, of course, chocolate syrup. A milkshake can be topped with whipped cream, sprinkles, maraschino cherries. 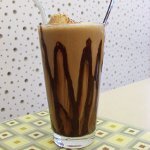 A chocolate milkshake can be made by adding chocolate syrup or cocoa powder to a regular milkshake or substituting chocolate ice cream for vanilla. It is a smooth, sweet, rich and frothy drink loved by many chocoholics. To celebrate the National Chocolate Milkshake Day, go out to your favorite ice cream shop, fast food restaurant, or diner and indulge yourself with a delicious milkshake. You can also make a chocolate milkshake at home. In a blender, combine 2 cups milk, 2 cups vanilla ice cream, 2 tbs chocolate syrup, and 3/4 tsp vanilla extract. Blend for 30 seconds, stir well and serve. You can garnish the beverage with whipped cream and/or chocolate shavings before serving.